Rowlinson Ryton 8x6 Octagonal Summerhouse: A superbly stylish and chic summerhouse with The unusual extended octagonal shape has the benefit of a round building giving so much more space but being a more solid structure, great for lazy days when seeking calm and tranquillity in the garden. Showing 2 of our total 11 reviews, with an average rating of 4 stars. 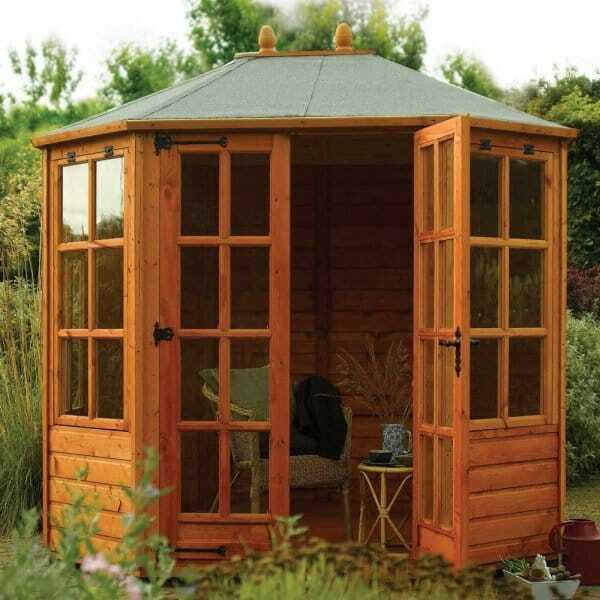 Read all 11 reviews for Rowlinson Ryton Summer House 8x6. Review - After four coats of paint it went together well. Very pleased with the result.looking forward to using it this summer. Delivery driver very helpful.thanks for a great service. R. Solloway. After four coats of paint it went together well. Very pleased with the result.looking forward to using it this summer. Delivery driver very helpful.thanks for a great service. R. Solloway.